Commercial buildings have a value beyond earning rent for their landlords. They are a key part of our economy. 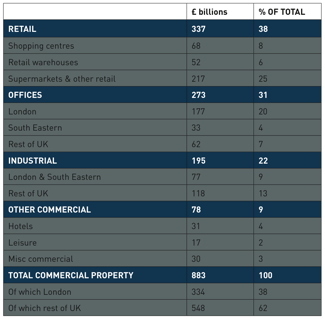 Commercial property accounts for £183 billion (around 6%) of insurance company and pension fund investments. UK banks and building societies hold 47% of outstanding loans on com- mercial buildings. And commer- cial property generates £14 billion in taxes for the Exchequer. The source of these figures is the Property Industry Alliance (PIA) annual report. The 2017 PIA report of shows that the value of commercial property in the UK was £883 billions. The graph here shows how this breaks down in terms of commercial property type. Over half of commercial property is rented, and lease lengths are starting to slowly increase following their reduction during the recession. Renting looks set to be a steady source of income, as businesses do not want to commit the financial and time resources to owning a building. With these figures in mind, anyone who doubts that MEES is likely to have an effect on the market may want to think again. If, as most people are estimating, 20% of buildings have an F or G EPC rating, that represents several billions in financial value. It seems likely that pension funds and banks will be pushing to ensure that the property they’re investing in does not carry the risk that it can’t be leased – and they have the power to drive improvements for higher EPC ratings. MEES may well be the first legislation that has the potential to link energy performance to financial value, and that really gives it some very sharp teeth.